Susan J. Bissonette once said, “"An optimist is the human personification of spring." So as these spring-like days infiltrate New England, are any of us optimistic about growing apricots? Like peaches, plums and nectarines, apricots are nutrient-hungry plants and if given these rich growing conditions can produce and mature rather quickly. Apricots are like all other temperate fruit trees, appreciating full sun, well-drained soil and proper spacing. The best part about apricots – this fruit can live a long life, about 75 years. Let’s check the answers from yesterday’s brain teasers and see how you want to proceed with apricots. 1) The apricot, Prunus armeniaca is a member of the Rose Family (Rosaceae). (True.) The Rose family is chock-full of interesting plants. It rates third on the list for food production. 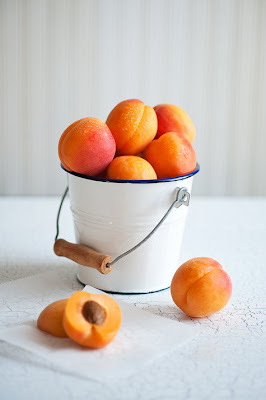 2) The apricot originated in Armenia. (False – China ) It was first believed that apricots originated in Armenia and therefore a portion of its name was derived - Armeniaca. However, there seems to be no denying its original habitat was China. Apricots were cultivated in other temperate regions throughout Europe and Asia and eventually introduced to the United States. The majority of the apricots commercially produced are canned or dried. Fresh apricots can be hard to come by and are rather pricey, which make planting an apricot tree tempting for New England gardens. 3) Georgia is the largest producer of apricots in the United States. (False – California.) California takes first place producing over 90% of the U.S. crop. Apricots have similarities to peaches. One little interesting tidbit about the Peach title: despite Georgia still being called the Peach State, California also produces more peaches than Georgia. 4) Apricots are one of the most drought-resistant fruit trees (True) Apricots, unlike peaches, plums and nectarines, which are very closely related, do not have the same water requirements and can thrive in relatively dry conditions. This is one of the main reasons you see apricots grown in Mediterranean climates. 5) Apricots are an early blooming fruit tree. (True) Apricots bloom very early in the Northeast and are at risk to late season frost damage. They wake up early and bloom early. If you decide to plant an apricot tree, try to avoid frost pockets where cold air can sit. Good air drainage, i.e., south facing and gently sloping locations may be your best bet. If you are interested in growing apricots, locating the liners (small bare root plants) is not always easy. Many of the suppliers sell out a year in advance so call around and see if there may be some stragglers. If not, order now for next year. This fruit tree is becoming increasingly popular for commercial growers in this region because of the high price the apricot can demand at market. To end the apricot dilemma, ‘should we grow, should we not grow’ question, let’s take Thomas Edison’s advice and use it as our inspirational thought for the day. "Opportunity is missed by most people because it is dressed in overalls and looks like work." Don’t forget to tell your social media gardening friends where they can find Annie’s Gardening Corner. The Fan Page on Facebook - ‘Bilowz Associates Inc. & Our Blog - Annie's Gardening Corner’ will have tidbits of information heading into spring only found there. You can either go to the blog via our website, http://www.bilowzassociates.com/ under Blog and click on ‘Follow our Fan Page on Facebook’ or direct link to the Fan Page, http://www.facebook.com/pages/Bilowz-Associates-Inc-Our-Blog-Annies-Gardening-Corner/325316334444 and become a fan. Have a great Tuesday.